What’s up with the bitter cold days and no snow? It’s almost the end of January! Do you realize I have three disappointed kids that await the snow? We still haven’t taken our annual “making snow angels” photos! How about we just skip it all to Summer, huh? In the meantime, I will enjoy those blondies. They take me away to a beach where the warm sun bathes my face, sweet breeze brushes my hair… Where my kids can have FUN outdoors, making sand castles… Where my Hubby and I can enjoy our favorite Summer drink – Piña Colada. Those bars are gooey and rich! The rum flavor and coconut truly reminds you of Summer and the white chocolate adds to looks and sweetness. The only thing I would change next time – is making them in 13″ x 9″ pan. They are sooo good! 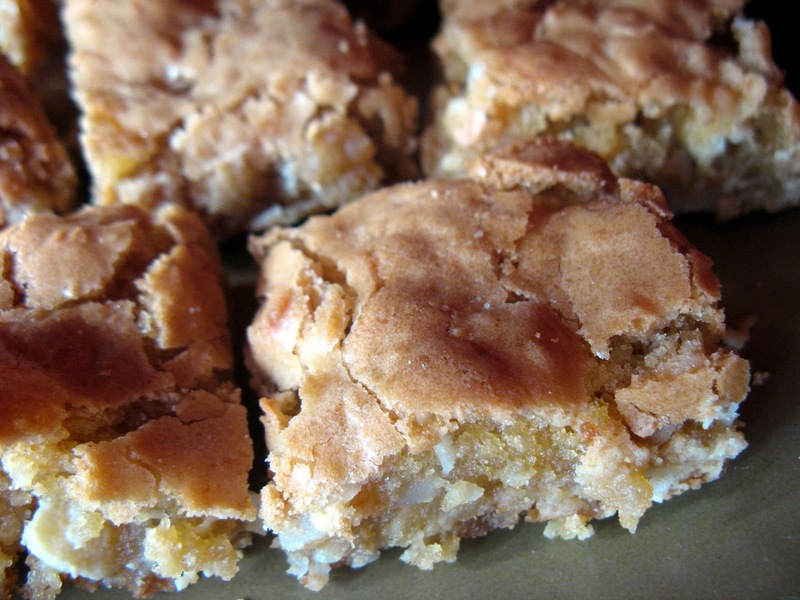 If you long to warm and sunny days, like we do, you should make those blondies. No mixer needed with this recipe. Grease and flour a 8″ x 8″ pan. Set aside. Preheat your oven to 350 degrees. In the meantime, in a medium mixing bowl, whisk together dry ingredients ( flour, baking powder and salt ). In a large mixing bowl, stir butter and sugar with a wooden spoon. Add egg and rum extract. Stir until all smooth. Slowly add the dry ingredients. Stir until all is well combined. Fold in the coconut and chocolate chips. Scrape the batter into prepared pan. Bake for 25-28 minutes. Let cool before cutting. Those bars are the best eaten the same day as baked. Store in air-tight container. What is the weather like in your part of country / world? Are you enjoying the outdoors? Wow I will totally be adapting this recipe! Sounds AWESOME! 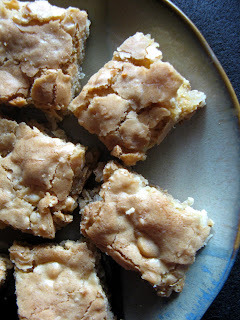 I've never had pina colada blondies before and this looks amazing. I'm sure the chocolate and coconut give this pastry a nice combination of flavor. Hi Ray! Thank you so much for stopping by! I hope you will try this recipe – it's amazing! Yes, you do, Claire! They are so worth it! You will love them 🙂 Thank you for stopping by! Thank you for your comment, Marie! This is a great blondies combination! I wish that our down-under Summer never ends too! 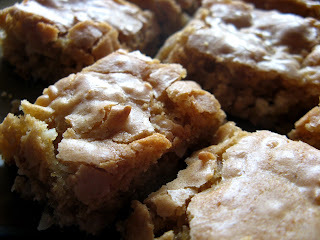 We used to love making blondies growing up! These look perfectly gooey and I love the addition of coconut! I hope you will try my version:) Thank you for stopping by! Right?! 🙂 Thank you, S.V.! these look absolutely delicious 🙂 my sister in law loves anything pina colada-I'm going to have to make these for her! Please do! Thank you for stopping by! Trying to psych yourself out of the cold making tropical treats-sounds like a delicious idea. You did make a grand choice with the pina colada flavor! The crackly top on these bars revealing the moist interior does induce a craving. Delicious post and very creative! Enjoy the evening. I love pina colada – the perfect summer drink. I think this recipe is brillient. What a delightful treat! I hope you get your snow soon. I have found it amazing as a new Florida resident that there are people here that have NEVER seen snow in their lives! I didn't know that was possible in the US!! My kids are missing it, but there is no hope of seeing any while the thermometer reads 75! I say send some our way! 75 – nice:) Thank you, Kristen! This is absolute yumminess! Can't wait to try them. Wow – these look delicious! Being a Florida girl who is intolerant to the cold…I gotta say I'm loving this! Hi, thanks for stopping by my blog. You have a lovely blog and I will definitely be back for more later. These look very tropical and summery. It's still winter over here in London but it's not been too bad. Hi Ramona! We should sign a petition or something: Bring the snow or Spring! LOL 🙂 Thank you for your comment! Hugs! After a week of snow it is raining here. I was also thinking to make something with coconut. the blondies look really chewy. It's a chewy heaven! Thank you, Balvinder! Anna, these look amazing! I'm a huge coconut nut…and I'd love to have a batch of these in my kitchen! We got some snow AND ice…ugh. Now were expecting thunderstorms and possible tornadoes overnight…so weird for January! I knew you are going to love them, Lizzy! I know you like coconut 🙂 Come to think of it, it's like we are foodie twins! lol Thank you! Hugs!